It was a quick decision for Brandon Wimbush as the graduate transfer took a visit to UCF over the weekend and committed to the Knights on Tuesday. 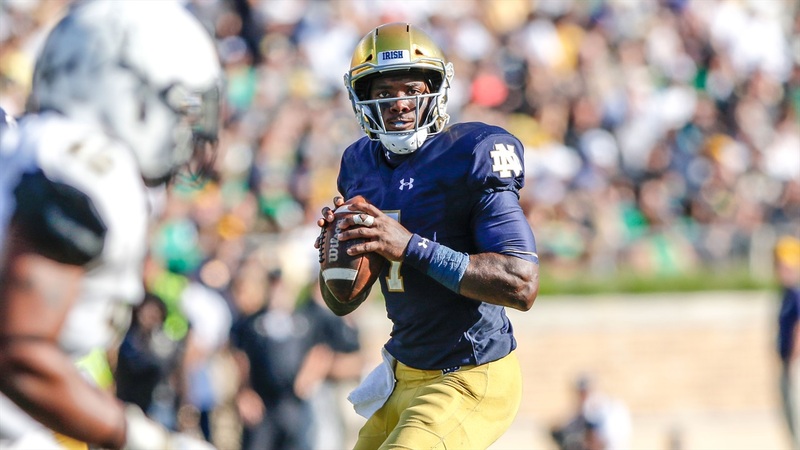 “The journey continues on,” Wimbush stated on Instagram. “A sincere thank you to Notre Dame for giving me endless opportunities on and off the field. Words truly can not describe what this incredible University and the PEOPLE mean to me and always will mean to me. I’m truly thankful. Cannot say it enough. The move makes a lot of sense from both sides as Wimbush is looking for an opportunity to put up big numbers and merely have fun during his final year of eligibility. UCF and head coach Josh Heupel can do just that. UCF is looking for quarterback depth as its starter McKenzie Milton suffered a terrible knee injury will likely need a year to rehab to see if he can even play again. The Knights return Darriel Mack Jr., who filled in for Milton quite well but was also just a freshman. Mack threw for 619 yards, three touchdowns but completed only 51% of his passes while running for 337 yards and six touchdowns. Wimbush will bring 2,606 passing yards, 20 touchdowns and 12 interceptions while adding 1,156 rushing yards and 16 touchdowns to the Knights program. The New Jersey native graduated from Notre Dame in December with an Accounting Degree.